Some physicists have come out with a paper on the Eurovision song contest. Of course, we at CT like to be ahead of the curve and thanks to Kieran’s ingenuity reported similar findings over a year ago. So much for this being “new research”. There has been much excitement about and focus on social networks in the past few years ranging from social networking sites to several high-profile books on the topic. Interestingly, much of the buzz about recent work covers research by physicists. It’s curious how physicists have expanded their research agenda to cover social phenomena. I thought their realm was the physical world. Of course, since social phenomena are extremely complex to study, as a social scientist, I certainly welcome the extra efforts put into this field of inquiry. People whose overall work focuses on social networks are represented by white dots, physicists by black ones, others by grey circles. (Click for a larger version of the image.) As is clear on the image, the worlds exist in isolation from each other. It would be interesting to see year-of-publication attached to the nodes to see the progression of work. In all the recent discussions about the relationship between physics and sociology in the study of social networks, the fundamental issue seems to have been lost sight of. The important issue is not whether the two disciplines can or should cooperate. That is essential and it happens frequently. Contributors to the discussion have pointed out many fruitful and important cases, and the history of sociology is full of many others. The big problem arises when academics from one discipline move into the area of another discipline without trying to discover what work has already been done by its practitioners. At best they reinvent the wheel. At worst they antagonise people with their intellectual arrogance. This is what has happened with much of the recent work on small worlds: physicists have argued that their methods and theories can illuminate social networks but have failed to realise that a whole community of sociological network researchers already exists and has done exactly the kind of work that they are pointing to. Their books claim to have made startling discoveries about the social world and advocate the development of new research programmes on these topics. Their reviewers take these claims at face value and so a reputation for intellectual novelty is built up. It is surely a basic failure of normal scholarly research procedures that these books can be written and published without the author undertaking any proper literature search. The author of one recent book expounding the novelty of the ‘power law’ does not seem to realise that sociological work over many years has documented the existence of this kind of distribution in many real social networks. None of this is cited. 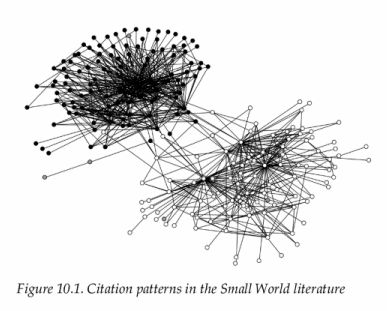 Its author does not seem to have discovered the existence of journals on social networks, nor does he seem to realise that INSNA exists and that the cover design of its newsletter shows a network with a power law structure. This same book is based around the author’s research into internet search engines, but it doesn’t seem as if he has ever typed the words ‘social networks’ into Google or any other search engine. If I were to come up with the idea that familiar theories from sociology could illuminate problems in physics, the first thing I would do would be a literature search to see if anybody, in physics or elsewhere, had already worked on the issue. Physicists who followed the same strategy when they wished to contribute something to social analysis, might find that they would be welcomed more warmly by their social science colleagues. The contributions to the ‘physics and sociology’ debate have, as with all the discussions on SOCNET, raised many interesting and important issues. Many contributors have, quite rightly, focused on issues of citation and priority, and how these affect issues of academic justice, and personal career chances. One contributor, however, made the important point that ‘advancing the science’ is the crucial matter, not personal status. The sociology of science shows that these issues cannot be separated, but it is certainly true that ‘advancing the science’ should be our fundamental concern. In this light, perhaps I can raise one crucial consequence of the failure to undertake basic literature surveys in a research area? contributes to advancing the science. Some contributors have suggested that such counsel may be unrealistic in an age of highly specialised scientific research, as the facilities are not available to allow it. One contributor, for example, asked whether easily searchable cross-discipline databases that cover both physics and sociology exist. Well, yes they do: they are called libraries, and their stock is accessible by catalogue and by browsing the shelves. People who write books and contribute to journals should have the necessary skills to use a library, and any decent academic library makes basic literature searches very easy. I have checked the library catalogue at the university of the leading physicist that I referred to in my original posting and that library contains a run of the journal Social Networks as well as the key texts and sources produced by Barry Wellman, Stan Wasserman and Katie Faust, and others. By all means let’s try to forget artificial disciplinary boundaries and join together to advance the science of social networks, recognising the potential that all specialists have for contributing to this. But let’s also remember the basic scholarly skills that make it possible for us to advance the science and for all of us to try stand on the shoulders of giants. If you are interested in some of the classics from the social sciences, feel free to take a look at the Social Networks reading list I worked with in graduate school. This entry was posted on Thursday, May 19th, 2005 at 12:47 pm	and is filed under Academia, Crooked Timber, Research. You can follow any responses to this entry through the RSS 2.0 feed. Both comments and pings are currently closed.